Classically detailed Santa Barbara styling features warm polished cherry wood flooring with dramatic Palladian light filled windows offering rolling fairway views of the Ambiente golf course framed by the distant McDowell Mountains.Nestled in the heart of Paradise Valley’s prettiest street, the lushly landscaped front courtyard welcomes w/ a blaze of glorious garden flowers. Gracious single level floor plan includes 3 en-suite bedrooms an an elegant wood paneled office. Spacious & well-appointed country kitchen, updated in 2004, opens to the wood beamed family room. Roof completely updated 2019. 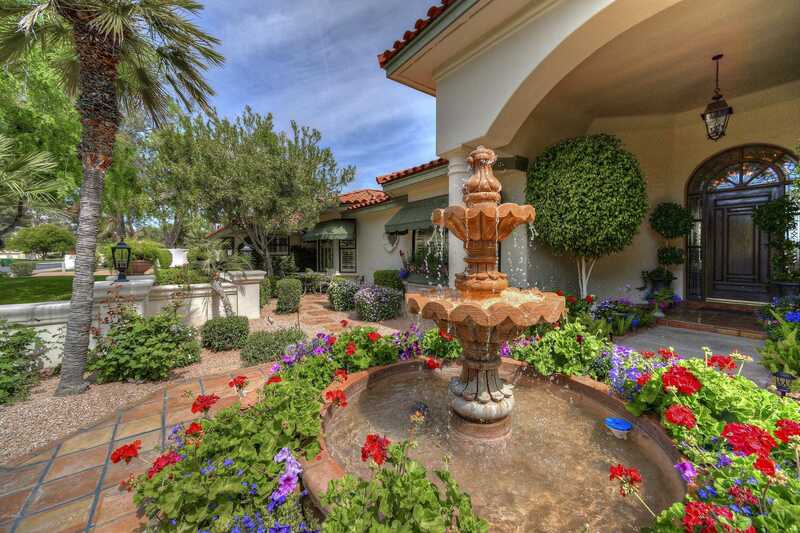 Gorgeous rear yard/patio’s mature landscaping provides a peaceful setting to enjoy the AZ sunshine! Partial plumbing update in 2004. Approximate size: 45533.00 sq. ft.
HOA name: Camelback Cntry Est.